While there is no doubt that the conservatory industry has declined in recent years, affected most recently by the economic downturn, the industry is still going strong. As such, conservatory roof manufacturers need to work harder than ever, investing in ongoing research and development to support retailers and satisfy the demands of today’s modern consumer. In order to really grab the attention of the modern consumer, it is important that retailers are up to date with current trends and able to offer the latest in conservatory roof innovations. Therefore, there is an onus on manufacturers to conduct ongoing research and development, leading to the introduction of industry leading products and technological advances designed to make life easier for conservatory fabricators and installers. Utilising their extensive design resources, manufacturers are now realising that in order to stay ahead of the game, they must focus efforts on producing products that work harder for both fitters and end users. Recognising a trend in conservatory colours and the need to cater for consumers looking for a wider palette of colour choices, leading designer and manufacturer of conservatory roof solutions, Ultraframe, developed a new suite of aluminium claddings. Further enhancing the proven technology used in Ultraframe’s Classic roof, the most popular conservatory roof on the market, the new Ultraframe Classic Aluminium suite combines state-of-the-art ideas and design technologies with elegant, contemporary profiles to provide a strong, rigid yet lightweight system that can be configured into virtually any roof design, to suit a wide range of consumer tastes. The range features aluminium glazing bar top caps, aluminium ridge body and low profile cresting, and aluminium cast ridge end, integral brush and weathering flashing, as standard. 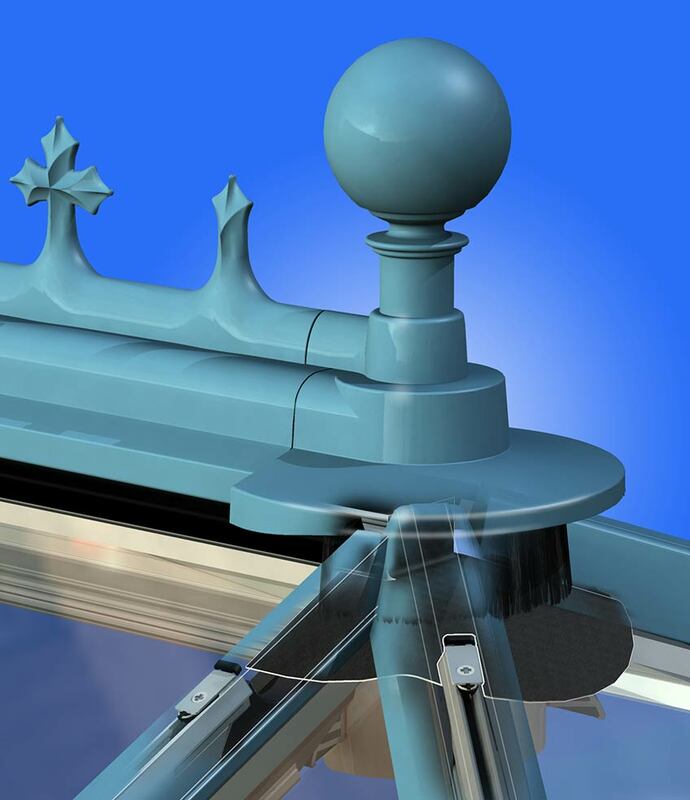 There is also the option to add a traditional aluminium cresting and ball finial too. It is the only aluminium suite on the market to offer a Cornice option– a decorative fascia designed to hide the PVC gutter and give the conservatory an enhanced appearance – other systems on the market make do with a PVC gutter. Further enhancements to this unique Cornice have been made with a die cast 135 and 90 degree corner cover, which will help fitters achieve a consistent fit and finish at critical junctions. As one of the country’s fastest growing retailers, Express Bi-Folding Doors in Leeds was one of the first to begin selling Ultraframe’s new suite of aluminium claddings. Managing Director of the company, Steve Bromberg, shares his thoughts on why the company has enjoyed excellent sales success with Ultraframe’s new offering. • Can you please tell us a bit about your company and your complete offering? We originally set up the company solely to manufacture and install aluminium bi folding doors, however, as we have grown as a company we have steadily increased our product portfolio. Today we offer a range of folding door systems in either timber, aluminium or a combination of the two, in line twin or triple track sliding doors, aluminium windows, composite windows and a range of aluminium roofing systems also. We are based in Leeds but service the entire UK and have three showrooms in Leeds, Redhill in Surrey and Romford in Essex. • Why did you choose Ultraframe to be your roofing partner? When we first used a conservatory roof, we were using an alternative system. While this worked well in the beginning, we soon found that we as a company were moving forward at a much faster rate than our previous roofing partner. We were not happy with their product development and felt that as we continued to offer superb products to our clientele high standards. When researching the market it became clear that Ultraframe was not only the market leader, but also one of the only companies investing in product development and actively trying to expand their operation. We found it refreshing to deal with a company who like ourselves refrained from complaining about the economic down turn and citing it is as justification for downsizing, and who were instead looking for opportunities’ within the market which could be utilised to sustain the growth and success of the company. • Have you enjoyed success with the system? How is it being received by the market? The main beneficiary of our link up with Ultraframe has undoubtedly been our installation teams, as the quality of the systems has made their job so much easier once on site. We have showcased the roofing systems and customers have been very pleased with the systems aesthetics, performance and the information we have been able to provide them regarding the technical specifications which Ultraframe have always been very forthcoming with when-ever we have required any assistance. • Is it having an effect on your sales? Have you had any feedback from your customers? Our partnership with Ultraframe must be having an effect on sales because we are installing more orangery roofs than ever before. Bi folding doors are our primary product but we are actively trying to promote our Orangery roofing department and this is moving forward as planned. The main feedback we do get is positive. Ultraframe is a well-known brand so when we are questioned as to who designed the system, the answer ‘Ultraframe’ usually results in a satisfied nod of the head from the customer. Our sales staff has complete faith in the quality of the product and they in turn demonstrate this to our customers, which helps to when it comes to winning more business. As the market leader in the design and manufacture of conservatory roofing systems for more than 20 years, Ultraframe’s ongoing commitment to research and development has led to the introduction of industry leading products and technological advances, such as its new aluminium suite of claddings, designed to make life easier for everyone.